*With $99 customer installation charge and purchase of alarm monitoring services. Termination Fee applies. For New Customers only. See important Terms and Conditions to this offer below. Do you have questions about home security alarm systems for your family? We have the answers! Your family deserves affordable and reliable home security protection. Find out about the helpful and dependable monitored home security systems services available to you, and home security tips, when you connect with the most respected home security companies. Will home security monitoring systems fit in your budget? Of course! 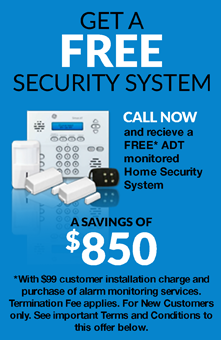 ADT monitored home security service is available with several low-cost price plans. There is a service option designed to meet the needs of every homeowner. Whether you're a homeowner with an entire family to think about, or a single person living alone, we can help you find a deal you can't afford to pass up. Check out the possibilities for enhanced home protection from one of the nation's very best home security monitoring companies. Are monitored home security alarm systems reliable? Definitely - dependability, up to date technology and conscientious customer service come together when you enjoy ADT home security monitoring services. Any time you experience a home security emergency or have a question, one quick call connects you with expertly trained service operators at one of six fully staffed monitoring centers across the U.S. Response technicians are ready to help you, every hour of every day. Each center operates 24 hours a day, 365 days a year. Security never takes time off. Can everyone in the family operate monitored home security systems? Yes; your home security systems and ADT security monitoring service are entirely user-friendly. Convenient items such as remote access key tags, simple control panels with easy-touch buttons and two-way communication, designed to let you talk directly with a live dispatch operator from up to 75' away, are just a few of the features that make your monitored home security system ideal for everyone in your household. Young and old alike, from the kids on up to grandparents, will be able to operate your ADT monitored security equipment. Why Choose Protect Your Home Security Services? Protect Your Home, offers ADT monitored home security systems - the choice of over 6 million homes across America! You can select helpful home security services designed to increase protection for your home or business. ADT home security monitoring services have been assisting consumers for over 130 years; that's experience you can trust! With packages designed to suit every budget, ADT Monitored Security has never been more affordable! ADT is #1 in customer service! Whether you have an emergency or question about your service, ADT is there for you. ADT monitors your home 24/7, 365 days a year. With 2-Way Voice option, you can communicate directly with a live ADT dispatcher from up to 75 feet from the control panel in case of emergency.